Inch Cape 2 was sunk by Inchcape Shipping in 2002 and now lies 22m deep. It is amazing how much it has flourished over the years. This lovely wreck dive is not far from Martini Rock. As you go around the edge of the deck, you are likely to see moray eels, scorpionfish, nudibranchs, and little boxfish. Come and unlock the mysteries of Inch Cape 2 with us. Marvel at its different terrain and rich wildlife. She is blanketed by bright yellow, pink, and purple corals. The railings and the ropes are inhabited by crabs which are well camouflaged by the growth of their shells. Divers can expect visibility of 8-10 meters. Penetrating a wreck is both exciting and challenging but safety is something that we take very seriously. 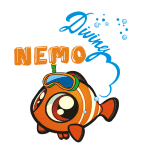 At Nemo Diving Center, we practice responsible wreck diving. Exploring this wreck is reserved for qualified certified divers looking for the ultimate adventure.